Dutch yard Van der Valk has announced the delivery of the latest model in its Continental Two collection, the 27 metre Anemeli. The largest model in the Dutch yard’s Continental Two series to date, Anemeli was developed in collaboration with Jaron Ginton of Ginton Naval Architects and built to Lloyd's Registry standards from an aluminium hull and superstructure. Construction on this project began in January 2016 and the handover was completed in the Netherlands earlier this summer. Styled inside and out by Guido de Groot, this fully MCA-compliant yacht is one of the first Van der Valk Continental models to feature a fast displacement hull design. 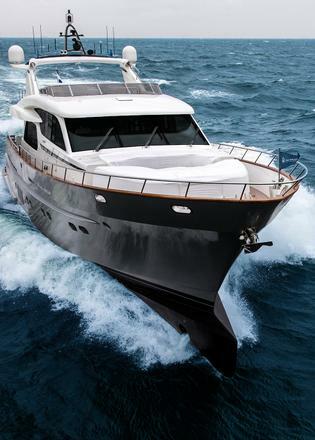 The yard adds that she was built for an owner with 30 years' experience in yachting, who requested a hull with a bulbous bow to improve performance and fuel efficiency. 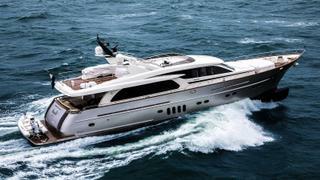 Other variations on the Van der Valk Continental Two formula include the silver hull finish and a large Opacmare Transformer bathing platform for tender storage, freeing up the entire superyacht sundeck for dining and relaxing. Anemeli has been fitted with a U-shaped foredeck seating area, shaded by a retractable Bimini, while her 6.72 metre beam allows for plenty of interior space. 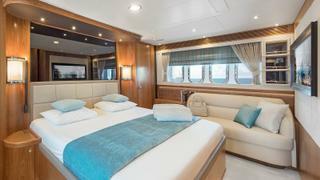 Accommodation for eight guests is all below decks, split across four en-suite cabins, including a full-beam master stateroom situated amidships, a VIP cabin in the bows and two twin cabins in between. 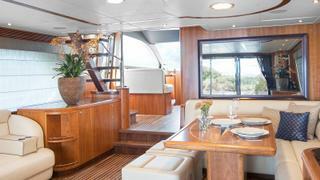 Her interior décor is described as "classical nautical", with warm cherrywood cabinetry offset by colourful accents. Practical features include a large lazarette with enough room to store a washer-drier, diving gear and two Sea Bobs. Power comes from a pair of 1,400hp MAN V12 1900 engines that allow for a top speed in excess of 30 knots, while her VEEM VG120 gyro stabilisation system — a first for a European yacht — ensures a comfortable cruising experience. Other superyacht projects currently under development at the Dutch yard include a 24.75 metre compact explorer yacht, which was recently launched and named Dutch Falcon, and a 26 metre yacht from the Van Der Valk Continental Three collection, both of which are due for completion before the end of the year.